Once upon a time, in a country called Turkey, there lived a young girl.. At the beginning of her teens, she had huge, thick, nerdy glasses, and practically no life outside of her school. Like most teens, she hated her body and her life, felt all the various dilemmas of that hormone-induced doom and gloom that is called puberty, and disliked most of her classes at school. If there was one thing in the world she loved the most, it was reading. She found solace and great companions in books, and read constantly and voraciously. She read at home, she read at school, she read during recess, she even read secretly under her desk in classes where she felt extremely bored. Almost every weekend she would go to the second-hand booksellers of Istanbul with her dad. These were magical places, and they felt like home. She especially loved being in 'Akmar Pasajı' in Kadıköy, a cluster of second hand bookstores, music stores selling LPs, cassettes, t-shirts, music band paraphernalia, quirky stores selling rocks and jewelry... With textbooks, fiction and non-fiction books, poetry collections and books in different languages piled on top of each other with sleepy cats snoozing in between them, this was a magical land that brought so much joy to her. Every time she went, she would bring back home a huge pile of books, both in English and in Turkish. She would read so much in such weird postures, and under such a spectrum of light to near darkness that her parents attributed her increasingly near-sighted eyes to her reading. They forbade her to read fiction unless she was sitting upright at a desk, with a lamp properly lighting the pages. It was around this time that she came across the books of Stephen King. A school friend let her borrow "Carrie" (Translated to Turkish), and in the pages of the books, she found herself. All of the awkwardness being a teenage girl, feelings of loneliness, isolation, frustration, desperation....everything was reflected in the pages. She immediately fell in love. This was an author who could truly peer into the human soul and could write great stories of what it felt to be human. When, at the age of 14 and walking towards her school, a speeding car hit her and she ended up in the hospital with severe bleeding and hip bone, Stephen King's novels aided in her recovery through a month of bedrest, and the opening pages of "Misery" describing a car accident felt too real, and too familiar. Stephen King's writing shaped her understanding of what good fiction writing was: mainly, good character development. All of his characters felt so real, so tangible, so wonderfully familiar that she felt like some of real life friends at her high school paled in comparison. Years passed, and she improved her English by starting to read Stephen King in English now, with an accelerating speed and gusto. As she read his books in the language they were written, she also improved her English, and got a good grasp of American popular culture without having once been in the New World. 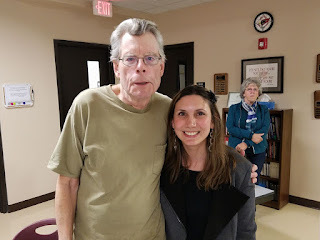 She read Stephen King all throughout middle school, high school and college. She grew into a young woman while reading his books. In a decade, she read through his complete oeuvre. Her friends made fun of her. People said that this was not "real literature". She said it was more real for her than reality itself, sometimes. All throughout her teenage years, her biggest dream was to meet the mind who created these worlds. The author behind these books. She dreamed of what she would say to him if she met him. She dreamed of shaking his hand and looking into his eyes and thanking him for everything. To her, this dream felt more distant than stars and galaxies. She was a Turkish girl living in Istanbul. He was a world-famous American author living in Maine. The mere possibility of their worlds ever intersecting at any point in her lifetime felt next to impossible. And then, somehow, miraculously, unbelievably, the impossible became possible. The power of reading came through for her. She completed her BA degree in Social and Political Sciences and, in her last year, at the urging of her professors, applied to graduate schools in the U.S.A. She got accepted into the University of Chicago where she completed her M.A. and Ph.D degrees. She ended up getting married, having kids and settling in Chicagoland. She started teaching in a small liberal arts college in a Chicago suburb called Naperville. She finally had built for herself the life she wanted. A lifetime of reading, writing, teaching. Then in the fall of 2017, at the beginning of her third year of teaching, a miracle happened. 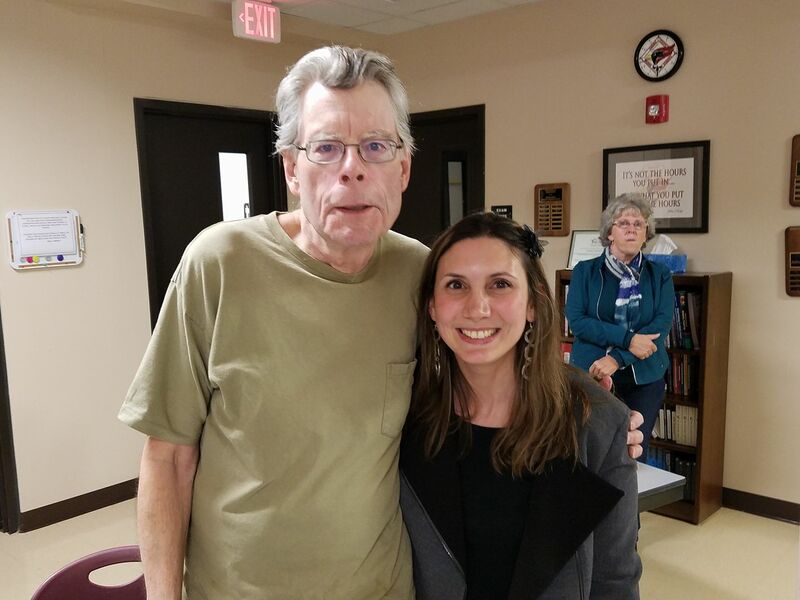 Stephen King, along with his son Owen King, decided to go on a book tour. And out of all the cities and the possible destinations in the Midwest and the state of Illinois, they chose Naperville as their destination. Not only Naperville, but the Res/Rec center of the very college in which she was teaching. It felt like an aligning of stars that was almost too good to be true. She immediately bought tickets. She contacted the people who invited King to speak at the college, and asked them if there would be an opportunity to meet him, but nothing was clear and nothing was promised. She did not dare dream, but she hoped against all hope that she would at least sit close to the stage. She waited in line with thousands of people who came from other states, some from the other side of these wide and vast United States of America. Everyone had the same bright gleam in their eyes. Everyone had come to see their favorite author live. And the rest of the evening was like a dream. The stars truly aligned. Somehow, she ended up at the front row to the left of the stage. Somehow, she ended up right across from the stage door. Somehow, she saw a fellow faculty member in front of the stage door. Somehow, the faculty member knew the organizers of the event. Somehow, she invited her backstage. And then, like every impossible dream becoming a reality, she felt like she was floating in the air.. She entered the backstage, she saw the author who she had dreamt of meeting so many times in her teens. He was eating a small sandwich (even authors are human, after all!). To her, it felt kind of an impingement on his privacy and she did not want to disturb him, but he stood up to greet her!! He shook his hand, and she thanked him for everything he had given the world. She said she grew up in Turkey reading his books. He nodded, smiled, said "Keep reading!" She met his son Owen. They took some photos. And she rushed back through the backstage doors, beaming, shining with the light of happiness and the lightness of a dream that had become real for her. That woman was me. As I exited the backstage door, went back to my chair among the thousands of fans who had come to hear their favorite author live, I was beaming with happiness. The air was charged with the electricity of expectancy. As I looked at the rest of the crowd and together we waited for Stephen and Owen to take their seats on stage, I thought about the power of literature. I thought about the power of writing. The power to bridge worlds. To connect thousands of people with the narration of one story. To bring together complete strangers, from different ethnic, religious, socioeconomic backgrounds, and make them into a community. To make a human into what she is, to pull her out of her world, her comfort zone, and bring her into a culture so different from her own. To make her dream a reality. I looked at the thousands of fans sitting there with me, and felt the magical connection we all shared, and sat upright, and leaned back.